I sent this note to Dana Young via email last night after she attempted to defend the last minute anti-gay mailers she sent out. Here's what she told the St. Pete Times: Young provided this response to Smith's criticisms: "It is absurd to say any of the advertising done by the campaign was "bashing" of any kind. Our campaign has taken clear positions on legitimate issues facing florida, and we differ on a variety of them. It is very fair to point out those differences. 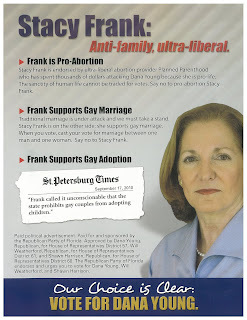 Stacy's support of gay marriage and gay adoption are legitimate issues being debated in Florida. 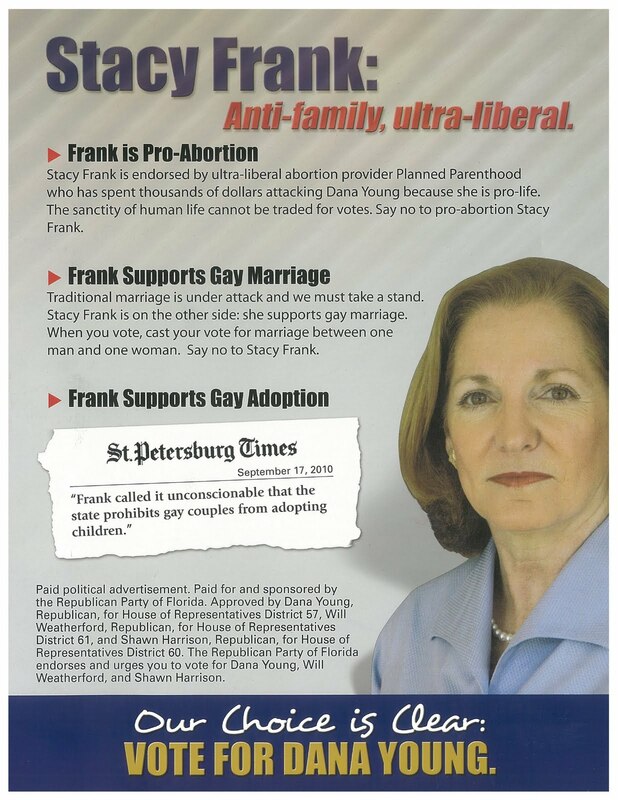 Equality Florida long ago endorsed Stacy, so it's no surprise that they are attempting last-minute attacks against me in the media. But their tactics are very disappointing, because they type of name calling they are engaging in has a chilling effect on free speech and our ability as candidates to debate legitimate issues." A mailer to a select few voters on the final days of the campaign is not an attempt to "debate the issues of the day." It is a maneuver to scrape up a few more votes by appealing to prejudice when the chance for rebuttal has passed. Here's a challenge to you: Spend time with gay people who, right now, are providing safe, loving homes for children in our state's foster care system. Talk to gay parents and their children to see what calling them "anti-family" feels like. Then read those flyers again and see if you have the decency to be ashamed of them. You are hurting real people by making Florida less safe for their families. Beyond all the politics, just as human beings, I hope you and your campaign advisors will think in terms of real people not just political slogans.